Looking to rent a construction class excavator, Komatsu – PC 210 LC-10 Super Long Front, in Rochester NY, Ithaca NY and Western New York? Super Long Front Attachments: designed for light duty work only. Features additional factory-installed counter weight & frame reinforcement. Primarily used for industrial applications (e.g. waste ponds), government applications (e.g. 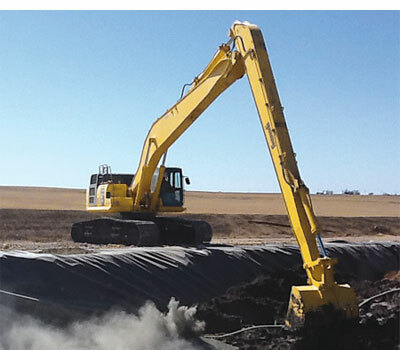 river & creek bed maintenance), construction applications (e.g. dredging of bridge foundations) and mining (e.g. waterway maintenance). Bucket Capacity = .6 cubic yards. Digging Depth = 37 feet, 9 inches. Maximum Reach = 50 feet, 0 inches.